Whoever said a burger has to be made with beef? 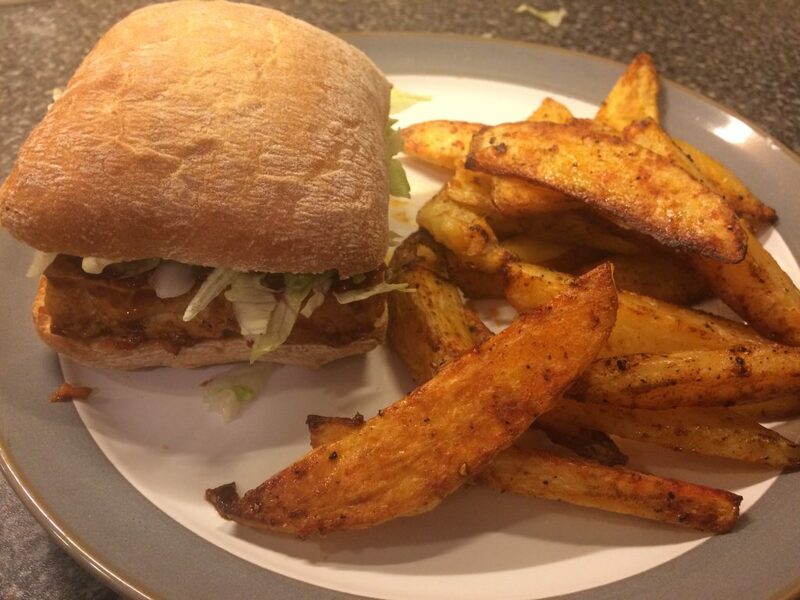 This Chinese Tofu Burgers with Paprika Wedges are simply delicious and a great tea for a Saturday night. Whether you’re vegan, vegetarian or just fancy a meat free meal, this is one that we’re sure you’ll want to do again and again. It takes around 1 hour to prepare and cook, but it’s well worth the wait. Firstly, heat your over to 200C for the wedges. Peel the potatoes and cut into wedges and place on an oven tray. Drizzle with olive oil and then season with salt, pepper and a generous amount of paprika. Give the wedges a toss so they are seasoned on both sides and place in the oven for around 40-50 minutes. Then, drain the tofu from the packet and cut the block in half (to make two burgers) and leave to dry on kitchen roll for about 20 minutes. Rest a book on top to help drain out the water. When the tofu is very dry, season with salt and pepper. Heat a generous amount of sunflower oil in a frying pan and place the two slices of tofu into the pan. Fry until golden brown on both sides and then remove from the pan and place on kitchen roll to dry. Now make the marinade for the burgers by heating some oil in a pan, add the garlic and grated ginger and cook for 1 minute. Add the soy sauce, rice wine, chilli garlic sauce and 3 tablespoons of the vegetable stock and give it a good stir. When it starts to bubble, it should start to become thicker and sticky in texture a minute or two later. At this point, add the tofu back into the pan and allow the sauce to marinade the tofu burgers for around 2 minutes. Cut the ciabatta’s in half and spread with sunflower spread, place the tofu burgers onto each ciabatta and add some lettuce to give it some crunch. Remove the wedges from the oven and place on the side of the plate next to the tofu burger. Season the wedges with salt and enjoy!